Preschool Storytime. Corvallis-Benton County Public Library, 645 NW Monroe Ave., Corvallis. 10:30 a.m. Free. Songs, stories, and rhymes ideal for preschoolers ages 4-5 years. Visit https://cbcpubliclibrary.net/ for more info. Music a la Carte. Oregon State University, Memorial Union Lounge, MU, 2501 SW Jefferson Way, Corvallis. Fridays. 12 p.m. Free. Music a la Carte, a free, lunch-hour concert series, has been a tradition at Oregon State University since 1969. 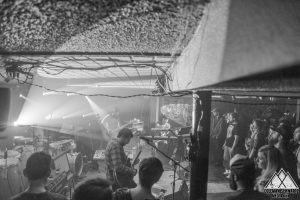 The concerts take place in the beautiful Memorial Union Lounge, most Fridays during fall, spring, and winter terms, beginning at 12 p.m. and lasting for approximately 45 minutes. They feature a variety of OSU music ensembles, faculty and student musicians, as well as regional, national and international guest artists. Visit mu.oregonstate.edu/main/ music-la-carte. 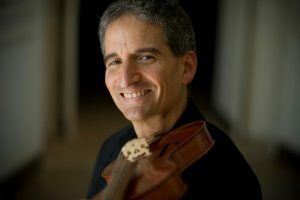 David Greenberg: Violin, Bach Meets Cape Breton. Corvallis-Benton County Public Library, 645 NW Monroe Ave., Corvallis. 12:00 p.m. Free. Bach Meets Cape Breton: violin and fiddle music performance and explanation of Baroque and Scottish styles. Questions and discussion welcome. Visit https://cbcpubliclibrary.net/ for more info. Movie Matinees at the Senior Center. Albany Senior Center. 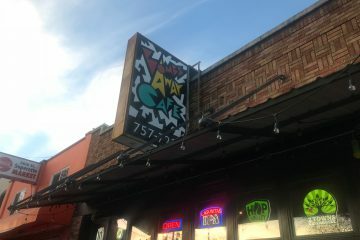 489 NW Water Ave., Albany. 12:30 p.m. Free. For information call: 541-917-7760. Teen Library Advisors. Corvallis-Benton County Public Library, 645 NW Monroe Ave., Corvallis. 4:30 p.m. Free. Teen advisors, or members of the Society for the Prevention of Boredom in Teens, meet monthly to plan teen events, as well as give input on teen spaces, and teen materials. Teens in middle and high school may apply to become members. Visit https://cbcpubliclibrary.net/ for more info. Teen Takeover: GAME CON. Corvallis-Benton County Public Library, 645 NW Monroe Ave., Corvallis. 6:30 p.m. Free. Teens takeover the library every third Friday of the month from 6:30-9pm. Snacks and materials provided. Open to teens in middle and high school. This month, join in a Game Con, featuring a wide variety of games in a lot of formats – come ready to play! This is an after-hours event, starting after the library has closed. Doors will open at 6:25pm; enter through Monroe Ave library doors, across from Central Park. Signed permission form required for all after-hours teen events. Available at library youth desk or at event. Visit https://cbcpubliclibrary.net/ for more info. Joe Jangles. Imagine Coffee, 5460 SW Philomath Blvd., Corvallis. 7-9 p.m. Free. Please come to Imagine Coffee for a night of tunes new and old, fabulous coffee, tea, and light fare. Visit https://imaginecoffee.net/ for info. Singu-hilarity: A Robot Comedy Variety Show. 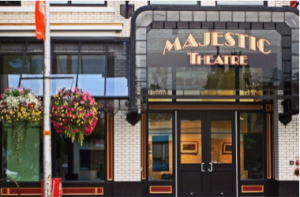 Majestic Theatre, 115 SW 2nd St., Corvallis. 7:00 p.m. $10. 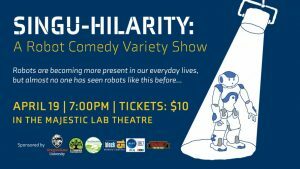 Robots are becoming more present in our everyday lives, but almost no one has seen robots like this before…join Jon the Robot (a robotic stand-up comedian) and some of our favorite nerdy, scientific, and autonomous performers for an evening of comedy, music, dance, and visual art. 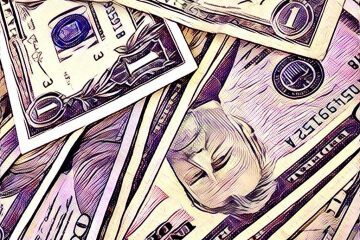 Acts will include stand-up comedy from Jon the Robot, Naomi Fitter of Oregon State’s CoRIS Institute, Ginger the Robot, Sarah Hagen of Oregon State’s Math Department, and The Irrelevant Podcast. Musical performances from the SpiderHarp and dance performances from the robot aquarium will help to keep the evening lively and vibrant. In the mood for even more robots after the show? We’ll also showcase some of our favorite robot artists in The Majestic Theatre’s art gallery during the week of April 15th.Visit http://www.majestic.org/ for more info. True Life Trio. Troubadour Music Center, 521 SW 2nd St., Corvallis. 8 p.m. $10. 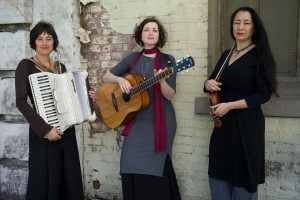 Featuring the powerful vocal talents of three dynamic performers whose musical collaboration was forged in Kitka Women’s Vocal Ensemble, this Bay Area–based trio delves deep into a vast array of folk music that lends itself to three-part vocal harmony, massaging and expanding the boundaries of these traditional styles. Visit https://www.facebook.com/events/290825558254202/ for more info. Sol Seed. DeMaggio’s New York Pizza, 151 NW Monroe Ave., Corvallis. 10:30 p.m. $10. 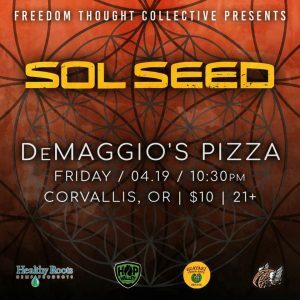 Sol Seed (Eugene, OR) returns to Corvallis hitting DeMaggio’s for their first time! Visit https://demaggiospizza.com for more info.